The presidency of Bill Clinton was riddled with controversy and scandal. It was almost a parody of itself. With content so rich, Clinton and pals get the musical theater treatment. They say timing is everything. And with Hilary on the verge of announcing her run for President, Clinton the Musical comes at just the right time, pun potentially intended. In Paul and Michael Hodge’s Clinton the Musical Hilary recants her “first presidency” and the two men she loved who happened to be the same man. 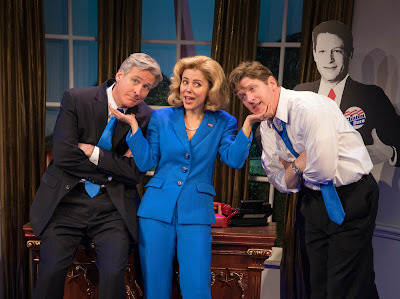 With a book by Paul and Michael Hodge and music and lyrics by Paul, Clinton the Musical is a 90 minute “SNL”-esque musical comedy that retells the scandal-laden two term presidency of Bill Clinton and his split personas, face of the nation WJ Clinton and smooth-talking, trouble-making Billy Clinton. The conceit is unique. It’s an idea that hasn’t quite been explored when mocking the 42nd President of the United States. But the remainder of the material includes reused and recycled jokes that still pack a punch. The era of the 90s is immediately addressed through Paul Hodge’s score. What comes next are a series of songs that are toe-tapping funny and occasionally raunchy, just like our main man Bill. By simply not giving the punch line the title of many songs, Hodge is able to garner genuine laughs to shine through, especially when certain songs are reprised and adjusted for certain characters. With a tale that the audience already knows the beginning, middle, and end, what comes next isn’t quite the surprise. It’s how the Hodges and director Dan Knechtges reveal it. And that’s what makes Clinton the Musical a blast to watch. By establishing the saga as a typical piece of musical theater, equipped with a hero with a dream, a villain with an evil scheme, a volatile love plot line, and an assortment of zany characters, how reality fits into the musical themes is where the comedy shines. Sure, the second half of the show may have a few too many ballads, the momentum is high from start to finish. Casting thoroughly can make or break a show. A stellar cast can make truly mediocre material look great. That's what this cast did. 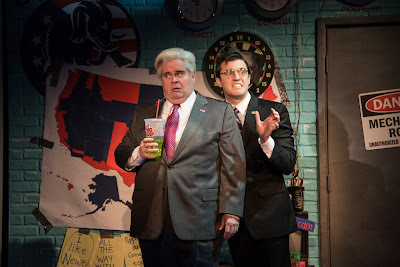 Doubling as good Bill and bad Bill, Tom Galantich and Duke LaFoon as WJ and Billy respectively brought the many personalities of America's 42nd President to the stage. Galantich and LaFoon were like a Phil Hartman and Darrell Hammond of the show. Both had two drastically different parodies of the same man and yet still were believable. They nailed the vocal cadence of Clinton and seamlessly eased into his physicality. Galantich, a little more so, found the humanity of Clinton that made his performance well rounded. Kerry Butler is a supreme performer. In the current age of Hilary where she’s been parodied by one of comedy's brightest stars, finding a unique spin on the First Lady is a great challenge. Butler was up for the task. Though she did have difficulty balancing Hilary singing voice with her own iconic vocals. Nevertheless, Butler takes Hilary and gives her an overeager and overambitious divalicious twist that makes her a great focal point. Everyone loves the bad guy. There’s something juicy that you want to sink your teeth into when it comes to a loveable villain, especially when you get a knockout actor in the role. A star was born in Kevin Zak's breakout performance as Kenneth Starr. Zak gave his Starr subtly funny intricacies that made him the perfect evil villain. From the claw of a hand to the erratic obsession of Bill to the ever-changing hair, Zak made Starr his own and truly gave a show-stopping performance. Zak is a triple threat that is bound for a bright future. The one performance that brought quite a happy shock was from gritty comic Judy Gold. Gold can not only carry a tune, but she can belt her face off. Her comic timing was second nature, but it was her musicality that was such a joy to watch. Getting the opportunity to play Hilary’s idol Eleanor Roosevelt as well as whistleblower and worst best friend ever, Linda Tripp, Gold continues to prove why she’s one of greatest comedians on the planet. As the beret-wearing subject of scandal, Veronica Kuehn gave Monica a sugary naive take that made her show-stopping number grand. John Treacy Egan was lights out as Speaker of the House Newt Gingrich. He and Zak had a wonderful report with one another that made their dynamic evil duo such a comedic highlight. Director Dan Knechtges took an iconic decade of American history and found relevancy. Knechtges brought the Hodges’ material to the stage in the grandest of fashions. His clever staging allowed for the site gags to land, though the portrait screens of Beowulf Boritt’s sometimes caused some visual problems. The production was cohesive and smart. Boritt’s set was iconic yet theatrical, something that resonates with the Clinton story. The costumes by David C. Woolard were particular and recognizable. The political colors were never overbearing, especially in front of the sea of blue of the set. It's not groundbreaking theater but Clinton the Musical is nothing short of entertaining and fun. The laughs are abundant and the performances tremendous. How will the Hodges handle the potential sequel after a Hilary presidency? Let's sit back and see!